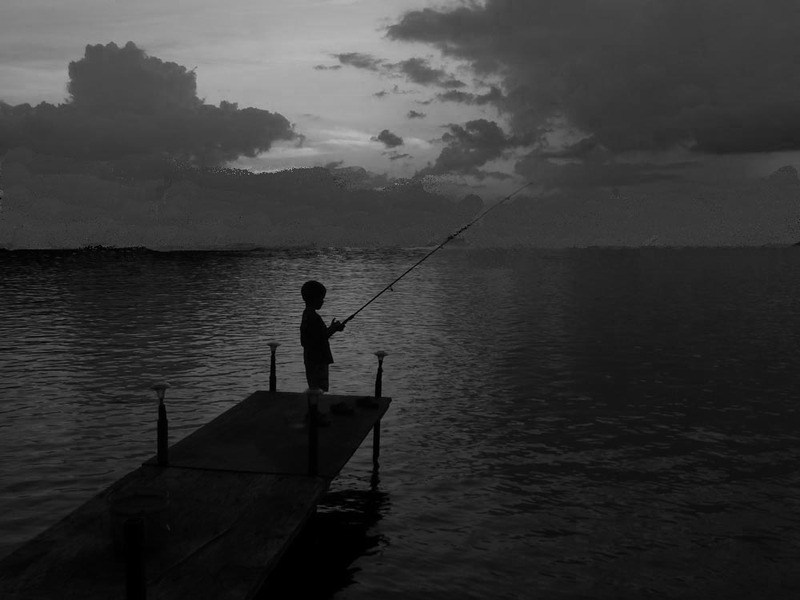 Photo (mom) Fishing off the dock where my sisters life nearly came to an end. When the spring break-up came and logging was finished for the summer, our family packed up everything at the Martineau River Camp and moved to a large log home on the North Shore of Cold Lake. It would be our home for the next two years. It was an idyllic place for kids with beaches and fishing and all things that would excite a young mind. Then suddenly it all changed. It was early spring 1946 at the Smith Place1 and my two and a half year old sister Louise and I had been playing on the dock. The water was still freezing cold as the ice had just left the lake a couple of weeks earlier. Dad and Uncle Warren were out on their first fishing trip since the ice had gone out and Aunt Liz and her kids had just left for town. Mom’s face went ashen; she dropped her tea towel, was out the door and running towards the dock before I could move. I followed her as fast as my legs could carry me. Hearing the panic in her voice I started running harder and I knew something terribly, terribly bad was happening. How suddenly that peaceful spring day had been shattered. A year earlier, in the spring of 1945, we had moved to the Smith Place after having spent the winter at the Martineau Logging camp. Our new home was located on a beautiful stretch of secluded beach and crystal clear waters on the north shore of Cold Lake about 20 miles from the town. The nearest neighbours were over five miles away. Our two story home was made of finely peeled and sawn logs. It sported a large front veranda facing southwest overlooking a scenic lake that would be hard to match anywhere in the world. Spectacular sunsets reflected in the crystal clear waters thrilled us during those lazy summer evenings when everyone sat on the veranda sipping drinks while listening to the radio. 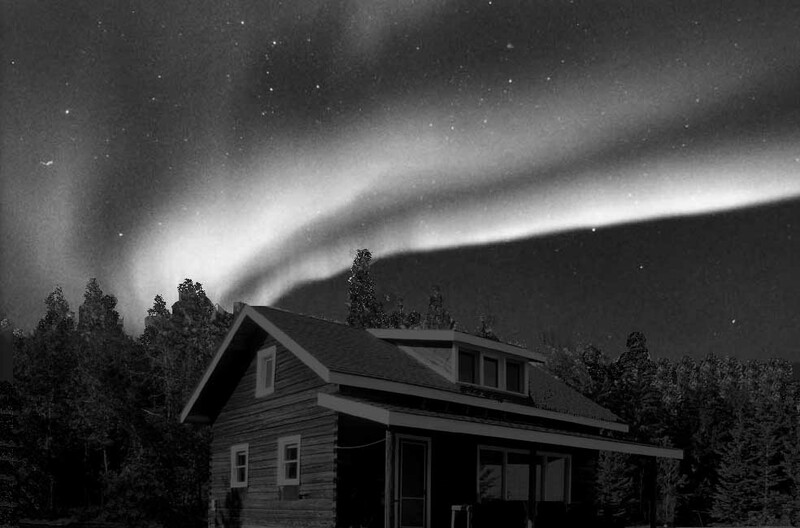 In the winter, transparent, emerald green northern lights moved across the sky like giant sheets blowing in the wind. They seemed to touch the peaks of the trees and house as they performed their winter magic light show. In addition to our family of four, there was Uncle Warren, Aunt Liz2 (my dad’s older sister) and three of Aunt Liz’s children: Emerson (13), Betty (6) and Stanley (3). We had all moved to the Smith Place after Uncle Warren and dad hatched a plan to start a mink and fox farm. Prior to moving to the Smith Place, Warren had worked with dad in the logging camp on the Martineau River. Aunt Liz was cooking in the kitchen at the Lakeview Hotel where her sister, Irene, was running the restaurant. Liz and her children had returned to Cold Lake when dad and mom had gone back to the Birch Lake farm to pick up the rest of our belongings the previous year. It was natural that Liz should meet Warren as he and dad often visited the hotel bar and restaurant when they were in town. It wasn’t long before she and Warren began a serious relationship. “Your dad and Warren were always looking for new opportunities so when they saw the mink and fox farming operation at the Enger Place, they thought it was a great idea. As soon as logging wrapped up, they began putting their plan into action. They learned the Smith Place was vacant and available to rent for as long as they wished. The location was ideal and the house big enough for our two families. With the grub stake from our winter’s work the men were able to purchase breeding stock from Willard Enger and other mink farmers in the area. For Louise and me, having other kids to play with every day was something new. 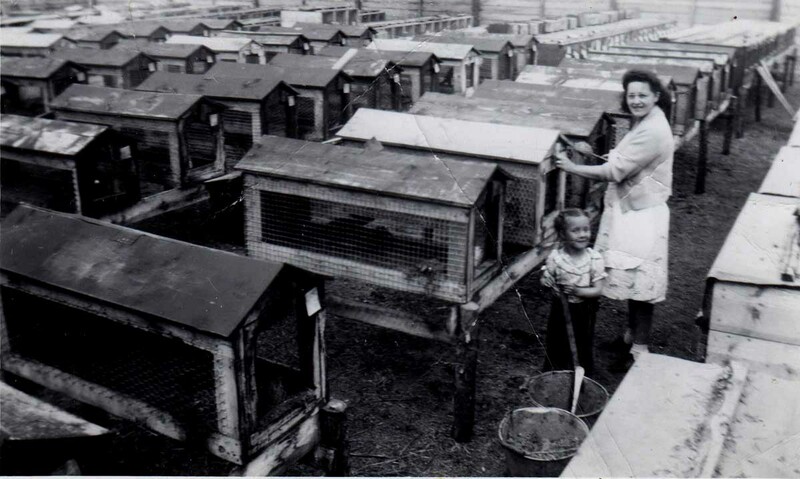 Although we were supposed to stay away from the fox and mink pens – particularly at breeding time -we used to sneak down to watch the animals. Most of the mink were black but the fox were a beautiful tinged red with large, bushy tails. We had never been so close to so many wild animals. 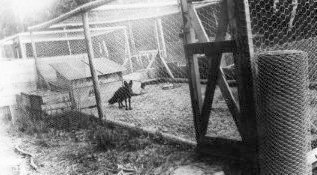 We watched fox running around their large pens in frantic circles, sometimes running so fast they could climb the wire, arch their back, hit the top and run down the other side. We thought they looked very upset and wondered if they would attack and eat us if they ever escaped. Because he was a little older, Emerson would tease us about letting a fox loose to chase us, but no fox ever escaped. When a mink escaped, as they often did after chewing a hole in their pen, they would try to hide nearby so as not to miss feeding time. This made them easy to catch as they only had to put a little feed in a cage with a trap door and wait for the mink to enter. Once inside the trap door would slam shut and the mink would be back in their regular pen. I don’t think any of those wily fox would have been so naïve. Although not as dangerous looking, the mink still packed a mean bite. If they managed to get a good hold of your finger they simply would not let go. Dad always wore leather gloves when working around the pens and if one happened to bite and hold, he would calmly take the ever present cigarette from between his lips and hold it to the animal’s nose. The mink would immediately let loose before the cigarette could do any damage. When I was a bit older and worked with dad, those little critters nailed me more than once. In order to feed the one hundred or so mink and twenty-five fox, dad and Uncle Warren went fishing almost every day. In the summer they set their nets by boat and in the winter used the horses and a caboose to move around the lake 3. Emerson, Bob (McNeill) and I often travelled with them on these expeditions. While they would sell some of the best fish (whitefish, trout, pickerel and northern pike) to raise cash, the majority would be ground for mink feed or chopped up for the fox. If extra feed was needed, they would occasionally buy and butcher an old horse. I remember when dad had to kill one of his old work horses. It was a sad day for all of us, especially for dad, but that was life in the 1940s. It was still largely a hand to mouth existence and an old horse that could not hold his own was soon destined for the meat grinder. In the winter, to supplement the family income, dad continued to log the few areas north of Cold Lake that were still open to permit while Warren looked after the mink and fox. I remember feeling so important when I travelled into the bush with dad to haul out logs. There was however, one point on the trip I always dreaded. That came on the return trip at the top of a very steep hill that led down to the house. Dad would always stop at the top and wrap a logging chain around the front runners of the sleigh. He would adjust the chain so it would dig into the hard packed snow in order to keep the sleigh from overrunning the horses. He would never let me ride that hill. Even though the runners were chained, dad knew there was always a chance of a run-a-way so he had me walk behind for the final half mile. If the horses began to lose control, dad intended to jack-knife the sleigh and tip the load in order to save the horses. Once the horses were safe, he intended to jump and knew it would dangerous, even more so if I was with him on the load. From my point of view (I was only four or five) I was just glad to be off the load on that stupid hill. I was always so afraid something would happen to my dad 4. While the two men worked hard, the women were also extremely busy. Not only did they have all the children to look after, they were also responsible for everything else around the house and garden. “Liz and I planted and tended a large garden that provided for most of our winter vegetable needs. As soon as the wild berries came into season, we picked and canned everything we could get our hands on. Because we only had stored ice to keep things cold during the summer, we also canned fish, chicken, duck, beef, moose, deer and the occasional bear. We had enough preserves to feed a small army. While we always had lots to eat, there was still a shortage of items such as flour, sugar, coffee and many other items as the war was still raging in Europe and rationing was a fact of life. We stocked up as much as we were allowed using ration cards and stored everything in a small storage area in the house. I always remember one time pulling out the flour and using the last part near the bottom of a 100 pound bag. Suddenly several mice scrambled out. I screamed and threw the bag. The little beggars had built a nest near the bottom. I was so disgusted I couldn’t eat bread for a couple of weeks. For the next while, we all had to be careful as I had set mouse traps everywhere. In the night you could occasionally hear a loud ‘snap’. Other than Louise, who was just a year and a half, you kids were left pretty much on your own. Emerson and Betty had regular chores in addition to some correspondence but even they had a lot of freedom to do what they wanted. In our spare time, such as it was, Aunt Liz and I taught you and Stanley how to swim and play safe around the water. I think Emerson and Betty had already learned. Although there was always more than enough work year round, the long, cold winters provided a bit a respite. Holidays such as Thanksgiving, Christmas and Easter were special times. At Christmas most gifts were handmade with many serving an everyday purpose. Items such as knitted sweaters, mittens, socks and scarves were always popular but the kids always received a special something from Santa. We played a lot of cards and board games. There was one particular board game that gave the youngest of our group a nickname. That game was called “Ouija.”5 In the game you would ask the board a question then put your fingers lightly on a small heart shaped piece of wood and your fingers would be mysteriously drawn toward the answer – spelled if the answer was a word or to a number if the question could be answered with a number. It turned out that of all the people in our two family groups, Louise, who was now two, had this uncanny ability to answer questions correctly. It didn’t take long before she became nicknamed “Wee Gee” and was queen of the Ouija Board. As we approached our second summer, it was one of those lazy days in early spring when Louise and I wandered along the beach throwing rocks and making sand castles. The water was still freezing cold so swimming was still out the question. A little while later we had walked out on the dock when I heard a splash. I looked toward the end and Louise was gone. I ran out and could see her sinking in the water. The water was at least six feet deep and I could not swim well enough to jump in. “Near the end of the dock mom, near the end, over there.” pointing to side where the boat was usually tied. The water was about five or six feet deep. Mom looked down and, at first, could see nothing: “Where Harold, where?” she screamed again. Suddenly she caught a glimpse of Louise’s brightly coloured dress slowly washing against the piling on the sandy bottom. Mom jumped into the water in her clothes and dove down. She came up sputtering with Louise in one hand. She couldn’t reach the dock and I was too small to grab Louise so mom had to paddle toward the shore until she could touch bottom. She lifted Louise’s limp body onto the dock. “I was terrified. I pushed her onto the dock and climbed up beside her. She was so little and her body was cold and limp. Her lips and fingers had turned blue and I was afraid she might be dead. 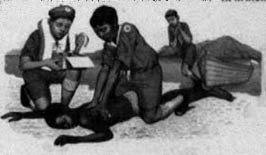 I had just read a short article in our doctor book about performing artificial respiration so rolled her over on her stomach and started pushing down on her back around her rib cage just as they showed in the book. Mom took Louise in her arms, hugged her and began to cry. Mom just sat there on the dock shivering and hugging her baby. All I could do was stand and watch. The images of that event are foggy in my mind but I knew, I just knew that I should have been keeping a closer eye on my little sister. Later that summer after the water had warmed, mom spent a lot of time teaching Louise to swim. She even taught her how to jump off the dock and swim to the shore. She was not going to take any chances that another fall into the water was going to be so dangerous in the future. While Louise did learn to swim, she never really overcame the fear of having her head under water. Louise now had two close brushes with death in her young life. Early the next spring would see another member of our family on death’s doorstep. 1 Mom told me the Smith placed was originally called the “Schmidt” place after a German family whose father had built the home. Mom said she understood the father had suddenly left under mysterious circumstances sometime during the early part of the war. She said the story that circulated around was the man was a German agent and had a short wave radio that he used to communicate with Germany. Everyone believed he had gone back to Germany. Whether this was just idle gossip or had some basis in fact will likely never be known. 2 Aunt Liz had moved to Cold Lake to be with other family members not long after her oldest child, Harvey, 18, suddenly died early in 1944. A few months later her husband of twenty-two years, Tart Dewan, passed away after a long illness. Uncle Tart was a rodeo bronco rider who had been injured many times and some suspected those injuries contributed to his untimely death. He left behind Aunt Liz and five children, with three of them still under the age of 12. 3 In the story of the Big Kinosoo, Chapter 3, a description of the early years of fishing on Cold Lake is provided. 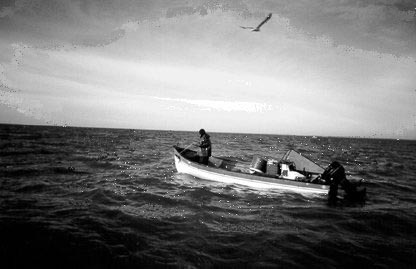 The descriptions of the methods of fishing are taken from the lives and times of my dad, Uncle Warren and their friends. 4 On the way home that afternoon, I noticed an old country road winding back down to the lake from the main road. It looked so familiar that I asked mom if that was the road leading to the old house where we used to live at the Smith Place. She thought it was so we decided to drive down. It had been over 6o years since either of us had been on that road. I could still see the images of dad with a load of logs piled high and wondering if he would make it safely to the bottom. On that hot summer day in August, when mom was nearly 90, we rounded a bend and there it was, the old house standing exactly as we had left it in 1947. We just stood there as the memories of those wonderful times flooded back. Wandering around the yard we could still find the exact spot where the mink and fox pens used to sit. Everything was overgrown with trees now 30 feet tall. That wonderful beach was exactly as it was when we left and the water crystal clear and inviting. Again in July 2010, while visiting my sister Louise and two of her grandsons at North Bay, I asked if she had ever been back to the old house. She said “no” so we grabbed two canoes and paddled the two kilometres to the old home-site. On this visit the owners were home so we chatted and learned his parents had purchased the home from the original owners. For Louise and me it was a “Return to Bountiful”. 5 A Ouija board (/ˈwiːdʒiː/), from French “oui” and German “ja” also known as a spirit board or talking board, is a flat board marked with letters, numbers, and other symbols, supposedly used to communicate with spirits. 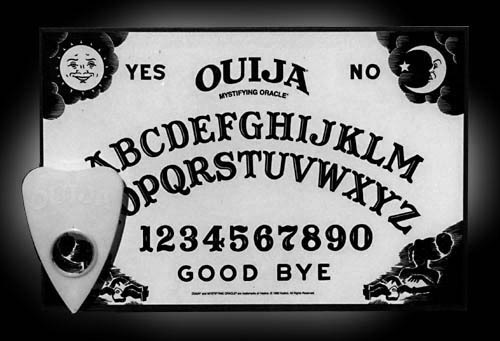 It uses a planchette (small heart-shaped piece of wood) or movable indicator to indicate the spirit’s message by spelling it out on the board during a séance. The fingers of the séance participants are placed on the planchette, which then moves about the board to spell out messages (Wikipedia).